Is Type 1 Diabetes An Autoimmune Disease? Type 1 Diabetes: Causes. Autoimmunity. Vaccine Safety. Progression. What is autoimmune reaction’s role in Type 1 Diabetes? Autoimmune reaction plays a decisive role in development of Type 1 Diabetes (T1D). The erroneous response of our defense system is known as autoimmune reaction; to fight self. Environmental triggers activate immune system such that it fails to recognize insulin producing beta cells in the pancreas, as own. Consequently, the auto antibodies formed gradually destroy the insulin producing beta cells as though they were some invaders. 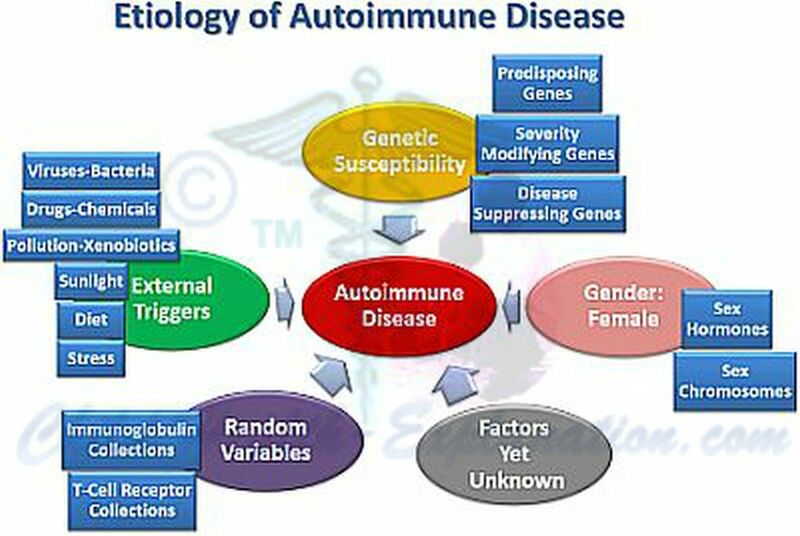 Autoimmune etiology is scientific correlation of various causes for development of autoimmune disease. Though girls are generally more prone to autoimmune disease, same is not found to be true for T1D. If at all, the incidence of Type 1 Diabetes in girls is only very marginally higher than that of boys. In T1D severity of damage caused by autoimmunity is dependent on the number and the concentration (titre) of antibodies. - Auto antibodies are formed against insulin, islet cells and glutamic acid decarboxylase. Children who develop all three types of antibodies are at 90% risk for developing clinical diabetes, whereas children with only one type of antibody are only at 30% risk. - Risk of clinical disease is also directly proportional to the intensity of autoimmune reaction; higher the antibody titres higher the risk of clinical disease. Progression of beta cells damage is dependent on the age at which a child develops autoimmune reaction. Younger the age at which insulin auto antibodies first appear, earlier is the development of auto antibodies against islet cells. Most children diagnosed T1D during middle childhood would have started producing insulin auto antibodies within first years of life. Extent of beta cells damage determines clinical presentation of diabetes. Most of the beta cells destruction in type 1 diabetes is attributed to autoimmune mechanism. Only a small fraction of nonfunctional beta cells are noted to be damaged by process other than autoimmune mechanism, the process of which yet remains to be determined. Several factors are believed to trigger or aggravate autoimmune mechanism, yet none are precisely known to be the cause of autoimmunity. The list is long and often confusing; various intrauterine influences, diet in infancy, missing adequate contact with some common infections during early childhood, stress and so on. Many common viruses have also been suspected to trigger the autoimmune disease in genetically susceptible children. But till date no single virus has been confirmed to be the trigger. Due to reports on viruses being possible triggers, there has been considerable apprehension about routine vaccinations given to children. Consequently, several scientific studies have been conducted to evaluate the risk: Results conclude that vaccinations included in the schedule do not increase the risk of Type 1 Diabetes. Furthermore, the studies show that adequate vaccination against mumps and whooping cough reduces the chances of juvenile diabetes.